J. Richard Harris earned his Bachelor’s degree from Princeton University in 1969 and continued his education at the University of Florida School of Law where he received his Juris Doctor degree in 1972. He specializes in real property, land use and corporate law and concentrates on condominium, commercial real estate, zoning and developmental approvals and brokerage cases. Mr. Harris is a Florida Bar Board Certified Real Estate Attorney. 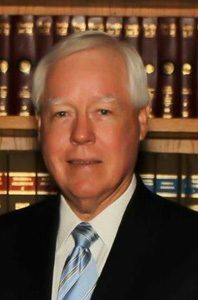 Mr. Harris is a member of the Florida Bar, where he served as Director of the Real Property Division from 1977 to 1979 and as Chairman of the Real Property, Probate and Trust Law Section during the years 1979 and 1980. He also served as the Chairman of the Liaison with the Real Estate Brokers Committee, the Liaison with Surveyors Committee and the Liaison with the Real Estate Developers Committee. He was a member of the Palm Beach County Realtor/Attorney Joint Committee and for more than 25 years acted as general counsel to the Northern Palm Beach County Association of Realtors and the Realtors Association of the Palm Beaches. AV rated by the Martindale-Hubbell Law Directory.